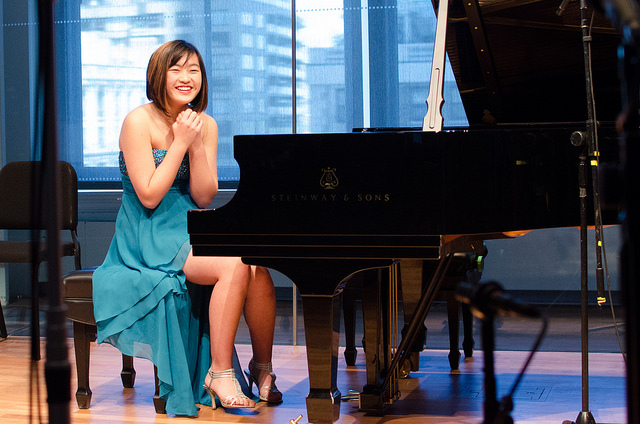 On Show 338 in New York City back in 2017, From the Top pianist Coco Ma shared her passion for writing with our listeners and described the young adult fantasy novel she was working on at the time. Her novel, SHADOW FROST, was still in manuscript form at the time, but Coco allowed us to publish an excerpt of the book’s prologue on our blog. Perhaps the most exciting part of Coco’s story happened after she performed on the show, thanks to a very special guest in the audience. A literary agent with a specialty in young adult fantasy novels happened to be in attendance, listening to Coco’s every note and word! A dedicated fan of the show, literary agent Richard Curtis reached out to our office after attending another of our live recordings in New York. He was proud and excited to let us know that he had accepted Coco for representation, put her finished novel through the editorial process, and sold it to Blackstone Publishers for print and audio publication worldwide! You can expect to see SHADOW FROST hit shelves sometime late 2018 or early 2019, with the two subsequent books of the trilogy to follow! Coco’s appearance on our show that day –and all that followed – would not have happened without the generous fans and listeners who have chosen to support From the Top. We invite you to help make moments like this happen for hundreds of young musicians each year. Together, we will give them the power to be the best musicians, artists, authors, and citizens they can be.